I've tried Ferretts IPS and I love it. I was so depleted of iron because the other iron supplements didn't agree with me. And now God has answered my prayers with your product. May God bless your business. Thank you so very much for helping me save my life. I’ve been taking the supplement for about one month now and it is by far the best (and only) iron supplement that I've been able to tolerate. I've never been able to swallow pills, so I took an "herbal"-based liquid iron supplement for several months. It was not at all effective, and my anemia actually worsened during that time. Next I tried various brands of iron capsules, but had to open the capsules and sprinkle the powder into my mouth. This resulted in blackened teeth, and burning in the throat and stomach. Not only did I experience digestive pain, but the supplements were not effective. My ferritin levels increased very minimally over three months and I remained cold and fatigued. Ferretts IPS is an entirely different experience. The liquid does not burn my throat. It does not leave stains on my teeth. I can take it with or without meals. I do not experience any digestive disturbances. Most importantly, it is working! Within just one month I've noticed a small increase in body temperature and a warmer pink color in my fingers and face. On my next blood test I am confident that iron levels will have improved. I truly believe Ferretts IPS is improving my quality of life, and I\'m so glad to have discovered it! Yes, I would recommend Ferretts IPS to a friend. Great for those who can't take pills. I am so glad I found this product. 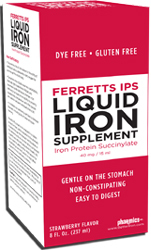 I now take my iron daily without the constipation from taking other forms of iron. I've been diagnosed with border-line anemia. I also have developed dysphagia (problem swallowing). Since iron deficiency sometimes is a factor in dysphagia, doc recommended iron supplementation. The first two I tried raised cane with my digestive tract. Ferretts IPS Liquid has not caused any side effects. It's easy and convenient to take. Besides, it tastes good!